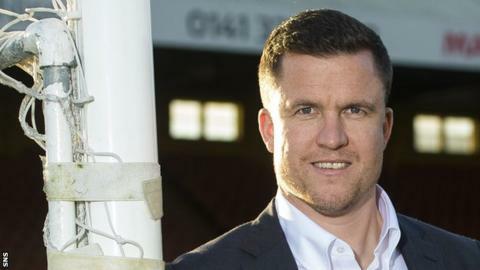 Gary Caldwell says he is an "infinitely better" manager as he begins his spell in charge of Partick Thistle. Caldwell has returned to his native Scotland after spells in charge of Chesterfield and Wigan, where he won the League One title in 2016. The former Celtic defender's first match in charge of the Jags will be away to Alloa on Saturday. "At 36 years old, to have what I have behind me is great for me and it's great for Partick Thistle," he said. "Having won a league already as a manager, I understand the process of what that takes and that's ultimately what we want to try and do." A struggling Wigan were relegated shortly after Caldwell took charge in 2015 but he got them back into the Championship at the first time of asking. He left in 2016 and a short spell in charge of Chesterfield followed last year, during which the Spireites were relegated to League Two. Caldwell said he had spoken "to different clubs" but that Thistle "feels like a great fit". Asked if he was a better manager following his experiences in England, Caldwell replied: "Infinitely better in so many different ways. "You come out the game, you go into coaching and managing. It's a totally different experience." Thistle were relegated via last season's play-offs and are eighth in the Championship after nine games played. "It's great to be here, great to start working with the players this morning and start bringing this football club back to where it should be," said Caldwell, who replaces the sacked Alan Archibald. "I look at the next game and I focus the players' minds on being ready and competitive to win the next game. I said to them this morning ultimately where we want to go will take time."